Pictures of Sienna Cathedral. 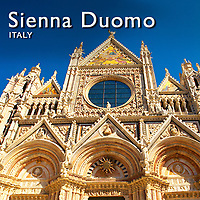 Images & photos of the great gothic Cathedral renassance Duomo of Sienna tos & photo art prints. The Cathedral of Siena (Duomo di Siena), dedicated from its earliest days as a Roman Catholic Marian church and now to Santa Maria Assunta (Most Holy Mary of Assumption), is a medieval church in Siena, central Italy. The cathedral itself was originally designed and completed between 1215 and 1263 on the site of an earlier structure. It has the form of a Latin cross with a slightly projecting transept, a dome and a bell tower. The dome rises from a hexagonal base with supporting columns. The lantern atop the dome was added by Gian Lorenzo Bernini. The nave is separated from the two aisles by semicircular arches. The exterior and interior are constructed of white and greenish-black marble in alternating stripes, with addition of red marble on the façade. Black and white are the symbolic colors of Siena, etiologically linked to black and white horses of the legendary city's founders, Senius and Aschius.